For the people who couldn't snag a pair of July 4th release of the Nike SB X Levi jeans, the skate shop exclusive jeans are in at Pure Board Shop. While not as limited, they are still a great pair of jeans. Thank God these jeans came out, I really wanted the super limited ones but couldn't get them in time. These are a great alternative. For months leading up to July 4th, calls flooded Pure Board Shop with questions about the super limited Nike SB X Levi Collaboration. 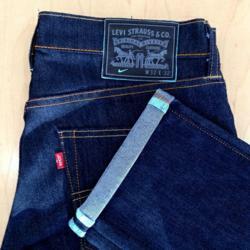 These jeans were made with the highest quality materials including Nike Dri-Fit and Vectran. They were produced using Levi's Patented Water-Less Technology. Sneakerheads everywhere wanted a pair of these Jeans but less than 1000 were made. Due to this limited production, Pure Board Shop was only able to get 9 pairs which all sold out within the week. But for all those who didn't get a pair, there is still hope! Nike SB and Levi have done it again. The new in-store only model of 511 jean features the Nike SB logo, Nike Dri-fit and Water-less manufacturing. The only difference is that they don't have the Vectran material which is what made the original collaborations so expensive. Without this material the jeans price is cut in half at $100 dollars. While these jeans aren't as limited, they are still skate shop exclusive. Pure Board Shop opened its doors on May of 2005. Its ease of access and parking make it a destination shop for riders and urban street ware fans alike. With their mix of products and variety in skate, snow, surf and exclusive streetwear and shoe brands Pure’s customers extend far beyond their Annapolis location. Pure prides itself on making customer service its number one priority, with product knowledge and having the right product mix a close second. The store and the website feature an ever growing brand inventory such as Nike SB, Nike Snowboarding, Adidas skateboarding, Vans, Diamond, HUF, LRG, RVCA and The Hundreds, as well as a large selection of Sunglasses and other accessories. The shop also prides itself on having the largest variety of longboard equipment in the area; with brands like Land Yactz, Rayne, Caliber, Cult Wheels, Abec11 and many more. Pure puts on monthly skateboard jams/events in their local skateboard park as well as sponsors many longboard slide jams and races in the DC Metro Area.